I’m almost afraid to write this post, because I am afraid all of you will ban me from your giveaways because I have too much! too much! 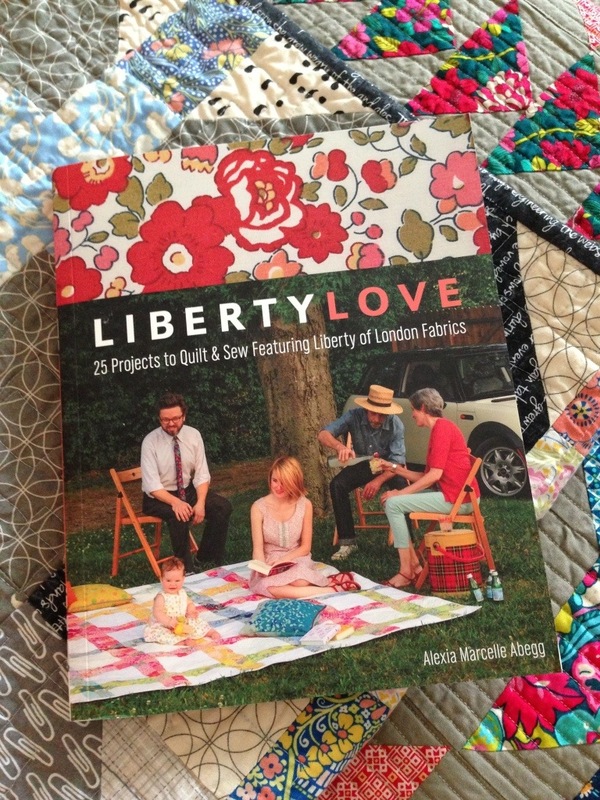 A couple of weeks ago I won Hydeeann’s Lucy Giveaway for a copy of Alexia Abegg’s book Liberty Love. Hydeeann held the giveaway as a pay-it-forward-style thank you to Lucy, who had gifted her some much-beloved hard-to-find fabric. So there’s that. Projects I’m dying to make from this book include but are not limited to: the Michelle My Belle Dress; Classic Thread Spool Quilt (the queen size, natch); and the Seashore Baby Quilt. Thank you so much Hydeeann! There’s kind of a long, amazingly sweet story here. About a year ago I found Marla’s blog, and was immediately hooked, because she was using pieces of that little vintage airplane print you see above. 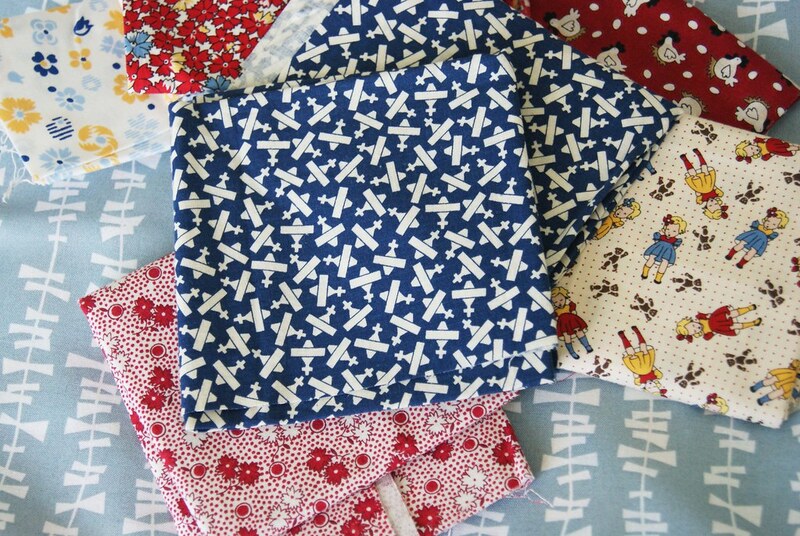 I commented that I loved the fabric, and she’s been a lovely blog friend ever since. Fast forward to her Mellifera quilt, about which I commented that she had collected some lovely fabrics. I wondered if they were repros–and they WEREN’T. 100% vintage fabrics. Of course I expressed jealousy. Enter Kim, who’s moving, like, kind of now. 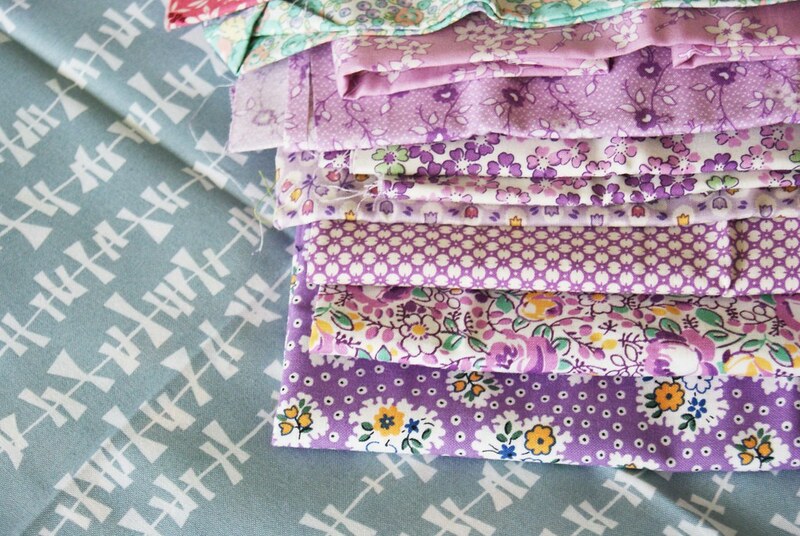 Kim had a bundle of vintage fabrics that she was ready to part ways with. 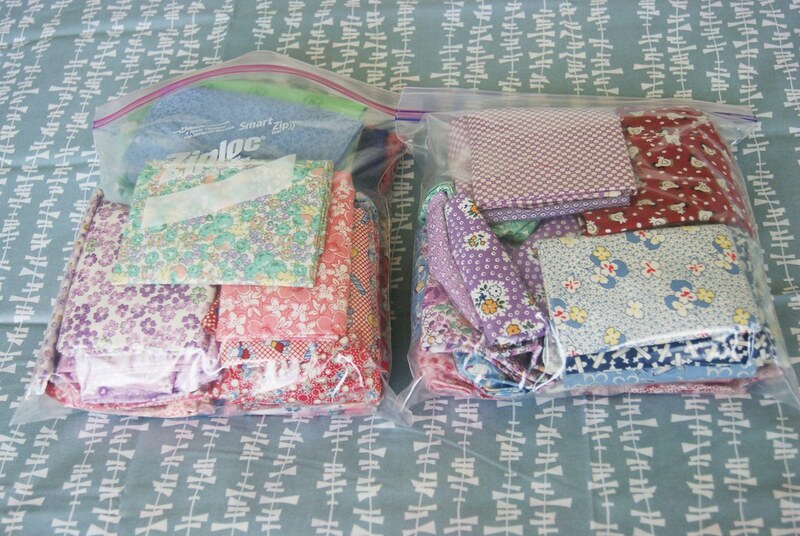 Marla sent her to me, and Kim sent me those two huge Ziplocs stuffed full of these gorgeous vintage fabrics. And they are gorgeous, aren’t they! They make me remember why purple was my favorite color as a child–those lavender prints would be an amazing little-girl quilt. Isn’t it wild how we online quilters function in this community where we not only trade encouragement, praise, and advice, but we send complete strangers fabric?! 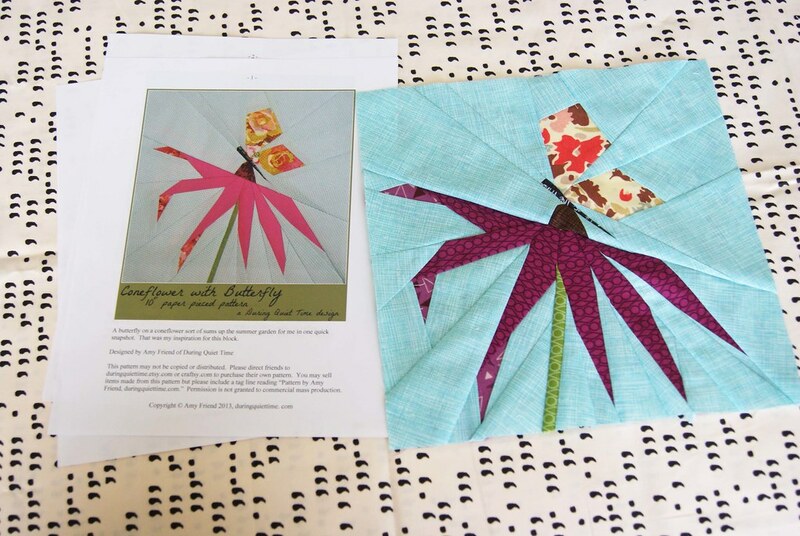 Finally, last weekend, I couldn’t stop thinking about Amy‘s recent paper-piecing pattern, Coneflower with Butterfly. I’ve never done any real paper-piecing before, only some simple paper piecing, and I asked Amy if she thought I could handle this pattern. She shared her pattern with me, encouraging me to try it. I’m so glad I did! It turned out beautifully. Amy’s digital drawing is so amazing, and this made for a very impressive finished block. I made liberal use of my seam ripper, but it did turn out pretty great in the end. I maybe wish I had chosen a better fabric for the coneflower petals? I hope to turn this piece into a wall hanging for my bedroom soon! Amy @ During Quiet Time’s patterns are all available for purchase in her Etsy shop. I may be trying some more after this success! What’s to come of all this kindness? Stay tuned for my very own pay-it-forward giveaway! I’m plotting and cutting and waiting for a little bit of mail to come. Can’t wait to share something with one of you! You are so very lucky. O love those 30s prints, originals! To die for! Hope to see what you make very soon. Whoa whoa whoa. How cool is this post??? Love this. And great placement of your awesome quilt up there. One of my all time faves of yours. They all are really. Yup… Super jealous! I love that liberty book luckily we have it at the library (one of the perks of working there is that I have influence in the collection /wink). I can’t wait to see what you do with those lovely vintage fabrics! Lovely generosity! I was looking at your paper pieced flower and thinking what lovely fabric you’d used for the petals and especially the subtle difference with the fold over bits, then I couldn’t believe it when you said you wished you’d done something different! Ps the little box that says follow sits over the post comment button-can you move it? It makes it hard to comment. It doesn’t always, and maybe it’s just a tricky iPad thing, but I can’t seem to work it out? That’s great! I agree that those purples would make a fantastic little girl’s quilt. Gonna have to change your blog name to Lucky Laura! Looks like you are reaping the rewards of being a great quilty friend. Can’t wait to see what you make with the sweet stash of fabric. Love your corn flower and butterfly! Great job! Those airplanes really are awesome. Just got that book too and I’m planning on making the Marcelle Medallion! What a fabulous time you’ve been having!!! Hmmm, I like the coneflower fabric and butterfly. I think the flower really pops on the background. It looks like a difficult block and you made it so beautiful! Those vintage fabrics are amazing. Glenna Hailey’s feedsack quilt book was the first quilting book I bought and repro fabric still remains my all time favorite. I’ve never owned any actual feedsacks or vintage fabric, but I think your adventure into using them sounds so exciting! That airplane fabric is just too special–how will you ever cut into it? I love to know that even in such a saturated world of online blogging, people are still connecting with each other in positive ways. I keep seeing amazing things with paper piecing but haven’t yet given it a try. Maybe someday! That block turned out beautifully! I love the colours/fabrics – it’ll make a great wall-hanging, very cheery, without being too saccharine.